I want to thank everyone who made a block for Nancy's Hen Party quilt. Those of you who saw Nancy's reaction would agree that it's what being in a guild is all about. The hens were wonderful and went together very well. The quilters stitched away for a few nights and the finished quilt was even better than I had hoped. You done good, ladies. Check out page 5 of the Jan/Feb issue of Quilter's Newsletter Magazine. The cover for the soon to be released book Shadow Quilts features a quilt that was designed by our very own Carol Honderich! Are we impressed or what?!? Congratulations, Carol. We look forward to seeing more of your creative endeavors now that school is over. Oh, by the way.........Carol is recovering from her surgery and needed some hand work to do to keep from going crazy so she appliquéd the leaf border for our relief sale quilt. Thank-you, Carol. It will make our humble nine patch quilt jump out and demand attention. Regular Meeting at Waterford Mennonite Church on 4th Monday at 6:30 PM. Some off-white print fabric squares (cut 5" square). Bring 5-10. We will also need some (a "handful") little 1-1/2" cut squares for the inside border. These should be a variety of the darker prints used in the 9-patch blocks. We will need a couple of ironing boards and irons set up. Here's what the finished quilt will look like. The appliqué borders are done. Feb. 28, 2000. Fran's Chairperson quilt will be assembled during this meeting. Bring your equipment. 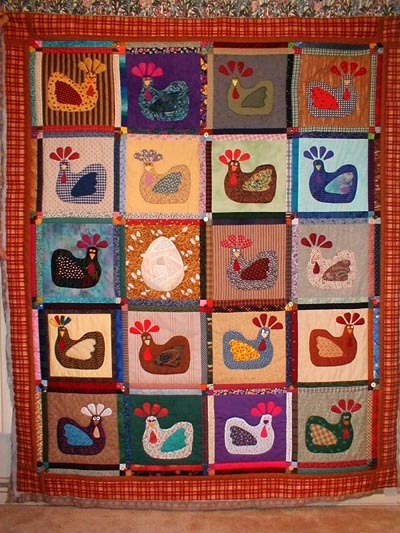 If you haven't made a block for this quilt and need a fabric kit see Fran at the January meeting, or call her at 533-4353. Mar. 27, 2000. (Tentative) Tessellation Designs, based on Jinny Beyer's new book. We'll learn what they are, how to make them and have some fun playing with designs. Indiana Heritage Quilt Show, March 2-4, Bloomington, Indiana. Gathering 2000, "A Pieceful Beginning," Saturday, March 18. This year's gathering is sponsored by the Heartland Quilters of Elkhart and will be held at St. Mary's College. Admission is $11. If you want to pre-register with Maple Leaf Quilters, please bring your registration fee to our January 24 meeting. Make checks payable to Heartland Quilters. Quilt Surface Design Symposium, June 11-23, Athens, Ohio. Brochures will be available at our January meeting, or visit their web site, http://www.qsds.com/symposium.html. The Symposium sponsors a two-week series of affordable training seminars, designed to provide hands-on training in a variety of Quilting-related textile art fabrication techniques and methods. Classes cover many topics ranging from physical construction techniques such as Fabric Dying, Fusing, and Collage, to developmental skills such as, putting together a presentation, and cultivating creativity. This Symposium is sponsored by Nancy Crow and Linda Fowler. Crazy patch in Christmas colors. Embroidery stitches optional. Appliqué block. Marie has patterns you can chose from or you can do your own. Green, blue, red and white to make a sampler quilt. Please make an effort to get caught up with the blocks if you are behind. The current challenge - Embellishments! Use trims, beads, buttons, ribbons, lace, fancy threads and stitches to create a 24" (at least) piece. It can be any style, any thing. Stretch yourself. Be bold. Go where you have never been before. Tell your old way of thinking to be quiet so you can surprise yourself. Go for it. The challenge is to be finished in May. It's time to think ahead. We will need to fill some offices when our "year" starts this June. We will need a Vice Chair and Treasurer. Please consider filling one of these positions. The Maple Leaf Quilters can only be successful when every one makes the effort to contribute. And, it would be sooooo nice if we had a historian--someone regular in attendance who can take pictures and document the events and happenings of our guild. We have had some wonderful things going on in our guild and nothing is being formally recorded. Let's get in gear with this before we let more time pass. Thanks to Fran, Paula and Carol for the great QUILTS... Now & Then display in the library showcase. Stop and check it out during the month of January.